20 miles from Auburn Courthouse. Easy-steep 15 miles, one way. If you enjoy hiking where you aren’t likely to see anyone except during the Western States run this is the place for you! This is one of the most remote sections of the entire trail and because it is more difficult to access, seldom used. With 15 miles of trail between Foresthill and Ford’s Bar you get great views of the Middle Fork Canyon with some easy walking stretches high above the river, but it does drop 2000 feet overall. Southern exposure means hot and dry in the summer but it also crosses some creeks that run wet all year. The trail can be reached as an extension of Driver’s Flat, from Foresthill, or from Todd Valley estates. You could also camp at Ford’s Bar and stay for days or, until State Park rangers notice you. Directions: Go 20 miles from Auburn to Foresthill. The trail is accessed from California street or from Mosquito Ridge Road right out of town. Otherwise you can get on it closer to Ford’s Bar from Todd Valley estates using Nugget to Alton Road. Or my favorite, go to Oakwood Lane, park and take the trail south that winds around the ridge to drop in 8 miles from Foresthill. Make sure you park on the Placer County part of Oakwood Lane, before it turns into a private road. The trail from Foresthill descends quickly to Dardanelles creek then levels out for a while along an old ditch to Pond Creek. This section was built by the Foresthill Power Company in 1920 to gather water for a hydro plant 1000 feet below, that generated electricity for the town and several mines in the area. This old generator was resurrected in 1981 and is still working today. Beyond Pond, the trail rolls up and down before a switch-backed descent to Peachstone Gulch where an old miner’s trail from the gold rush era takes you down to Ford’s Bar. Try to imagine the town here with its own post office beside the river. A stage coach used to make a run here long ago using the Nugget Road (Ford’s Bar Road). If you crossed the river you could take the Roanoke trail up to Georgetown from Ford’s Bar. I was wondering if you might be able to help me with this hike. I access it from Todd Valley, the first Todd Valley road. I’ve attempted it three times and cannot for the life of me find how the WST continues from anywhere near Ford’s Bar to Peachstone Gulch. Every time I end up at Ford’s Bar and there is nowhere to go left except into the river! (I know the area to the west on the WST toward Francisco’s/Ruck-A-Chucky, no problem.) I bushwhacked east on the banks of and above the Middle Fork today to confirm for myself that there is indeed no WST trail proper continuing east of Ford’s Bar. Both the “American River Insiders’ Guide” and the description above, while helpful, seem to miss some important detail for the hiker to get on the correct trail to Peachstone Gulch. I’m not sure what that is. The “ARIG” directs the hiker to park at the round dirt area (fine, got that), go left into the clearing to start the trail (okay, went there and continued down to the Ford’s Bar). I’ve followed the directions and took every single side trail on the property above in the hopes of finding the WST going East but to no avail. 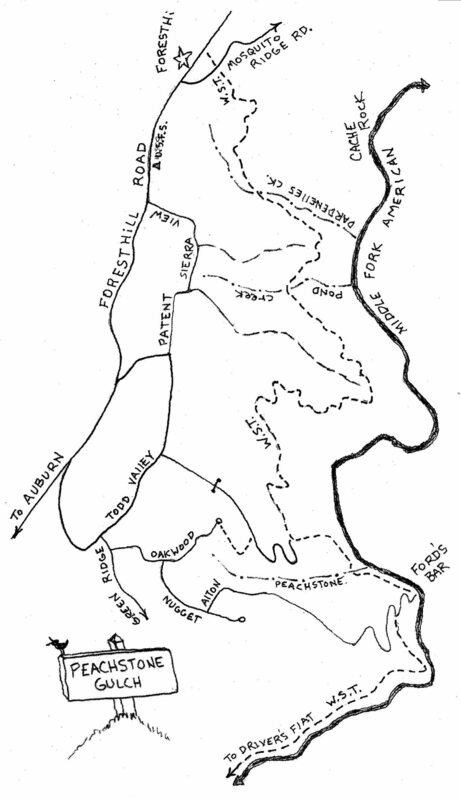 I assume, while one map clearly shows the hike going down to Ford’s Bar to continue to Peachstone (and onward to Dardanelles) that this just isn’t the case, i.e. that one does not actually go down to Ford’s Bar but there is a trail higher up where one came from. Or is the river too high now and is covering the trail? Is the supposed entrance (as I haven’t tried it and seen it for myself) off Mosquito Ridge by Foresthill more straightforward? Thanks in advance if you can clear up my predicament with this trail. Love the site! Lots of good hikes mentioned and described. Have forwarded your question to the author via email. It could be a few days before he responds.